"Stayed here for a few nights for a conference. The hotel staff were super helpful and friendly, I believe the man at the desk was David. He helped me find trails to walk and gave me directions. This place is an easy walk to town square. The room was nice, could use some updated decoration. The view of the mountains, especially in the morning, was really cool. I stayed in a two level room. My only complaint is there was no TV upstairs in the bedroom. I fall asleep with the TV on and pictures online showed one, but I just watched Netflix on my phone. Internet was fast and reliable." "We checked into the hotel and the desk clerk had our keys and room info immediately. He was so nice and very friendly! The clerk gave me 2 passes... one for me husband and one for me. The passes were free passes to be used for renting a canoe or kayak or bikes,at the nearby activity center or to use them for golf or for the sauna or steam room or swimming pool at the recreation center. When my husband and I were out in the car getting ready to bring our bags into the hotel, the clerk ran outside with two keys to a bigger room that he wanted to upgrade us to for free. So nice! The room is huge! A king size bed, a couch, work desk, refrigerator, microwave and large big screen TV." Our annual trip to the Inn! Papa gets to enjoy seeing his grandkids ski. "We love the Valley Inn. We come here every year. It’s clean, comfortable, and the people are always friendly! 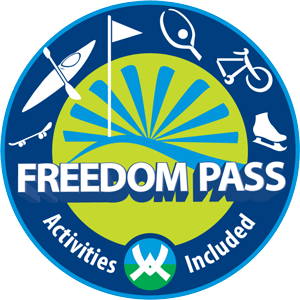 My kids love the freedom pass which gives access to the pool. We love playing games by the fire and the breakfast is simple yet perfect for us!" "My family and I (as well as several other families) stayed at the Valley Inn for a hockey tournament last weekend. The lobby is welcoming and comfortable and the woman at the front desk (who worked day and night all weekend) was friendly and more than accommodating. They allowed the hockey groups to utilize their function rooms for gathering in between games and for eating. It’s was perfect! Breakfast was included both mornings and is perfect for what we were looking for. Continental with cold cereals, breads and pastries. Our room was very clean and modern. There was plenty of room for kids to gather in the rooms and beds were comfortable. We will most certainly be staying at the Valley Inn for future trips and recommending it to family and friends. Thank you to all who made the weekend amazing!!" "For many years during the 1990’s and mid-2000’s, our family of four would take a week vacation during the summer months in Waterville Valley. The Valley provides a great backdrop for family oriented vacations as there is as much as you might want to do or as little as you might want to do. We stayed at a WV hotel which unfortunately seriously declined over the years. A few weeks ago, over the Fourth of July week we decided to return to WV and take our chances at the Valley Inn. I might add that it was a great choice. The Inn’s desk employees were friendly and most helpful and the price was most reasonable. The rooms were spacious and very clean. The bed was very comfortable and the room had a large flat screen TV. The price included the use of the Valley facilities which included 9 holes of golf, paddle boats/kayaks, free bike rentals and more. The Valley center had an ample amount of restaurants and shops. We spent two great nights at the Inn and, without doubt, will be returning." "Didn’t know what to expect and was pleasantly surprised. Room was great for what we needed. Has a coffee maker which is a plus. The lady at the front desk today was what made the stay stand out as she was very friendly and welcoming. We found out she was a Disney fan and enjoyed a great chat about Disney. We got stuck in the rain and when we got back to the hotel I had a cup of tea and she gave my kids 2 hot chocolate pods to make hot chocolate to me that’s going above and beyond and it was just a great moment thanks Valley Inn"
The Valley Inn is the perfect location for everybody. We are located near many local businesses for the corporate visitor and we are located near many attractions. The Valley Inn can be a home away from home to all visitors.